How Do You Fit the Whole Family into a Selfie? One of the hardest pictures to snap is a simple group shot of your family. Whether using your smartphone or pocket camera, it’s not that easy to stick your arm out, reverse the camera and blindly click a decent family selfie. As a result, I’ve shot countless pictures of my son and wife over the past few years, but there are only a few dozen successful Team Lester portraits. Sure, you could hand over your camera to a stranger, but that assumes there’s someone close by. And somebody who can take a decent shot. And if you happen to be enjoying a little family hike, you’re probably out of luck, unless you want to train a nearby bear in the art of photography. Of course you can create a more formal photo setup using a tripod and your camera’s countdown timer. 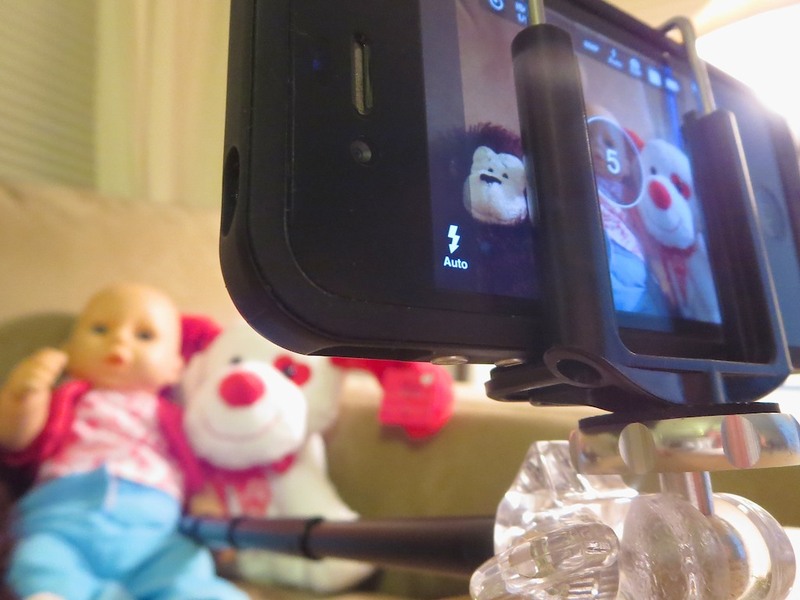 You can even pull out a little GuerrillaPod or Tiltpod from your pocket to steady the shot. But that still requires you to run around like a mad hatter. Then your little snapshot quickly devolves into a lengthy ‘production’ for everyone. It’s painless and zippy if you can just stick out your arm and magically get the shot, right? So given the choice, you’re probably going to go for the selfie. And if you’ve chosen that path, here are a few suggestions to help you get the entire family unit over the photo finish line with you. It helps a whole lot if you have a camera with a wider-angle lens. That makes it easier for your camera to ‘see’ everyone from the short distance your arm provides. I know you can’t do anything about your lens specs when you’re trying snap a group selfie in the middle of Times Square. But you should always keep your lens in mind when you’re shopping for your next camera. Canon PowerShot G16 with its 28 mm focal length lens. Just because you feel all hip and cool shooting a ‘selfie’ doesn’t mean you should forget about the basic rules of good photography. Make sure you’re facing the sun or your main light source. You want everyone to look their best, right? Lens specs aside, everybody still really needs to scrunch in. I’ve crammed in up to 6-7 people and still got them all in the selfie. And if done right, these can become your best pics of the day! If you’re using your iPhone, it doesn’t help to have to guess where the red icon is on your screen when you’ve got it facing away from you. Plus if you don’t have the digital dexterity of Houdini, you have a pretty good chance of dropping your smartphone before you even get the shot. The good news is the side volume button doubles as the camera’s trigger. If you arm just isn’t long enough to get the job done, it’s time to stretch your ability by using a little telescoping pole with a camera mount on the end. This can be especially useful if you’re using your smartphone. Its fixed lens likely offers a tighter field of view than your digital camera. There are a lot of these mini poles on the market and some extend out more than others. I suggest buying only the length you need, simply because you don’t want to lug around extra weight. I finally decided on the $24.99 Digipower TP-QPPRO QuikPod Pro. It seemed a little sturdier than the competition, and it extends 20 inches. But that’s plenty for my basic selfie requirements. You might have been wondering how useful this kind of contraption is if you can’t see the framing of your shot. It’s got a tiny mirror, which reflects your image back at you. But you still have to make sure the camera tilt is appropriate and facing you. More importantly, the QuikPod can mount digital cameras, the GoPro camera as well as your smartphone! Using the QuikPod (or any other monopod assistance) does require you to use the timer on your camera or download a countdown app for your iPhone. Extending the QuikPod out straight at a level angle will ensure the pole gets in the shot. You’ve got to position the pole at a 45-degree angle to hide it from view. Just don’t drop the camera when you’re unscrewing it from the QuikPod’s base, like I did! Fortunately my stunned Canon Elph still had a heart beat. So now equipped with the power of a longer arm and these tips to follow, you’ve got a fighting chance to capture that group selfie you’ve been looking for! And when you say you’ll go to any length to get your shot, I’ll know you’re not kidding!